Adventure Time creator Pendleton Ward hasn’t written and storyboarded a new episode since season 5’s “Bad Timing,” but he makes his big comeback with tonight’s “High Strangeness.” Given the episode’s title, I expected something weird, but I wasn’t prepared for just how bizarre this story is, introducing Tree Trunks’ secret alien family and putting her in direct conflict with Princess Bubblegum, who is branded a fascist by members of the Candy Kingdom’s small resistance force. While I’m not condoning the use of mind-altering substances while watching this episode, this feels like an Adventure Time chapter tailor-made for viewing after a few bong rips, full of surreal imagery tethered to a bewildering story. This is one of those episodes that left me wondering “What did I just watch?”, and while I think I’ve picked up on the general message of the story, I still feel like a lot has gone over my head. In the opening moments we learn that Tree Trunks has an alien husband and six alien babies that she sees when she’s abducted every so often, and the first scene of Tree Trunks on the alien spaceship is very discomforting thanks to the slowed down vocals and visuals like a giant mantis buzz sawing through a carrot. Ward and fellow writer/storyboard artist Sam Alden want the audience to be uneasy, a feeling that contrasts with the joyful calm Tree Trunks feels when she visits her second family. Tree Trunks isn’t frightened by these aliens, and one of the major themes of the episode is Tree Trunks’ general fearlessness. 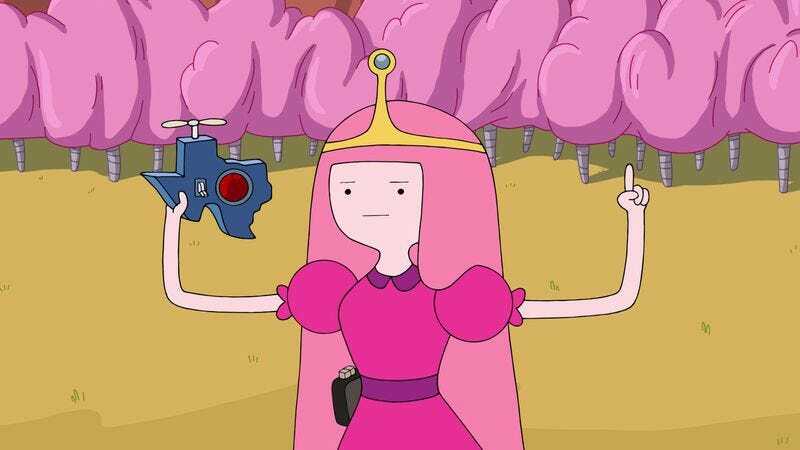 This is both a good and a bad thing, though, and when Princess Bubblegum commits an action that Tree Trunks doesn’t agree with, she goes whole-hog in fighting against the Candy Kingdom’s ruler. When Princess Bubblegum’s rocket full of little gummy people crashes into the alien spaceship orbiting Ooo, Tree Trunks is horrified at the carnage that ensues when these gummies sprout into full-sized candy people. Once she gets back on the ground, Tree Trunks immediately starts mobilizing against PB, and she meets a group of like-minded individuals when she gets a secret message from Starchy. Starchy being the recruiter for the Candy Kingdom resistance is an immediate indicator that this group is incompetent. To get to the resistance meeting, Starchy takes Tree Trunks on an elaborate underground path that leads to the door that is literally feet away from their starting point, and you get the sense that the resistance has no idea how to actually bring about any real change. They just want some kind of change to happen. The group plots to take out PB’s arsenal of rockets, but when they’re caught in the act, Tree Trunks discovers the true intent of the machines. PB isn’t planning a full-scale galactic invasion, she’s spearheading a new space program that will seed new Candy Kingdoms across the universe because the Candy Kingdom may not last on Ooo. It’s impossible not to see parallels between this episode and the current political climate in the United States, where there’s genuine fear of a fascist takeover by President Trump. (I have the feeling that the visual of Tree Trunks blowing glitter on a poster board to create a sparkly “Fascist” sign is going to get a lot of play on social media once it’s turned into a .gif.) You have a group of people convinced that a benevolent ruler is actually a fascist when she’s taking steps to ensure the future of her people in the face of a slew of threats to their safety, and most of the resistance’s ideas are founded on unsubstantiated conspiracy theories rather than facts. A poster in the resistance’s meeting room indicates that they long for the return of the King Of Ooo, a self-obsessed fool who had no idea how to properly govern and ended up putting the Candy Kingdom in total crisis. I don’t know when Ward and Alden started working on this episode, but it ends up being a very timely story given the events of the last few months. 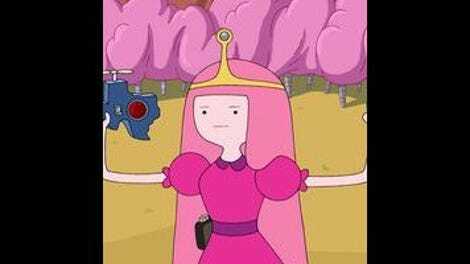 While Princess Bubblegum can definitely be considered an autocrat, she doesn’t fit the fascist label, as she’s genuinely concerned for the wellbeing of all people in the Candy Kingdom. Occasionally her actions have unforeseen detrimental consequences, but she’s also learned over the course of this series to own up to her mistakes and fix things when they go awry. Tree Trunks sees this in PB, and even though she knows that the two of them will never be friends, Tree Trunks ultimately shows compassion and understanding once she gets the full story. They don’t need to agree, but they can still respect each other, and it’s a message that is sorely needed as this country becomes increasingly divided. Tree Trunks’ alien husband walking backward is a nice little touch that reinforces his alien nature. I love the Alien reference when one of the new candy people bursts through the torso of the praying mantis. Chestbursters are the best. Jake as superchair is pretty awesome.